Gold has been one of the best investment assets since the start of the year increasing by more than 20%. Recently, Billionaire investor George Soros cuts US stocks by 37% and buying gold. Soros bought 1.05 million shares in SPDR Gold Trust, which tracks the price of bullion and took a stake in Barrick Gold Corp, which is the world’s biggest producer of gold, amounted to $264 million. Why? What exactly is gold and silver? How are the economic conditions going to affect the prices of gold and silver? Ultimately, you want to know if you should own some of the precious metals and if you are going to make money when you buy gold / silver for investment reason? I shall leave you with diverging views from two experts below. Another legendary investor Ray Dalio (one of my favorites) said this about gold, counterintuitive to Warren Buffett’s theory. Dalio advocates investors to have 5% to 10% of their assets in gold. Maybe 5% in gold stocks and 5% in bullion and then rebalance every year. Refer to his interview here. “I would say that we are in an environment where it is very important to have a well-diversified portfolio, and that'll include assets gold. In other words, what could I tell investors, try to achieve balance in various ways. That's a whole subject about how to do it. Anyway, this article will be the first of Gold and Silver series articles. In this first article, it will basically be an introduction about things you need to know when investing in physical gold and opening a UOB silver account. In the next article (in progress now), I will delve into the history of precious metals and its impact to the global monetary system. By the way, I went to UOB Main Branch at Raffles Place. I assume it is the easiest. Otherwise just call up UOB bank hotline to ask how to buy physical gold and open silver account. Pretty much “idiot proof”. 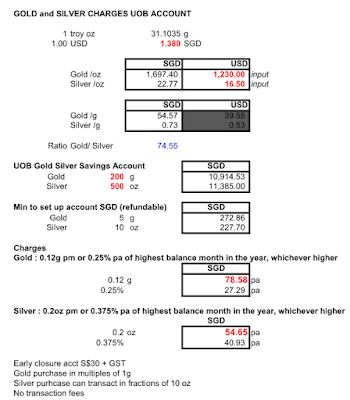 For now, I will like to bring you “additional uncommonly known info” you may need to know when you buy physical gold with UOB bank in Singapore and when you opened a UOB Silver account. First, get the buy and sell UNIT of gold correct. Gold price is calculated in troy ounce and not in ounce. So troy ounce is about 10% heavier. Visit UOB website here, and then click tab -> Rates and Fees -> check our indicative gold and silver prices! Below is a table showing indicative pricing. You see the prices of different types of gold. Always note the buy and sell prices for the loss spread. The smaller the loss spread during buy and sell, the better it is. During my purchase of physical gold, I was advised by the UOB staff that for investment purposes, 1 KG of Cast Bars is the cheapest to trade with UOB as you can also see above. In other words, the loss on spreads is much lower if you happen to buy and sell on the same time! However it costs ~>50KSGD per Kg with little divisibility. Imagine you misplace your 1 KG of gold….woooohoooo heartache! Therefore, if you are afraid to misplace it or wanted more divisibility with a reasonable investment amount of >5KSGD and a reasonable loss spread, then 100 GM Argor cast bar is a good choice! Further smaller divisibility, then you can buy Bullion coins at 1 OZ each but loss spread is higher. However the advantage is that it comes with many different designs suitable for gifts. Likewise, PAMP Gold Bars comes with different designs. Below is a typical 100 GM Argor Cast Bar I own. Another thing to note is “DO NOT OPEN THE SEAL!” Once seal is opened, UOB will not buy back the gold at all. There is also a unique code for each gold bar. The invoice itself does not cost additional money. What I am saying is if we lost the invoice per 100gm of gold we bought, UOB will charge S$100 deduct from the buy back price. 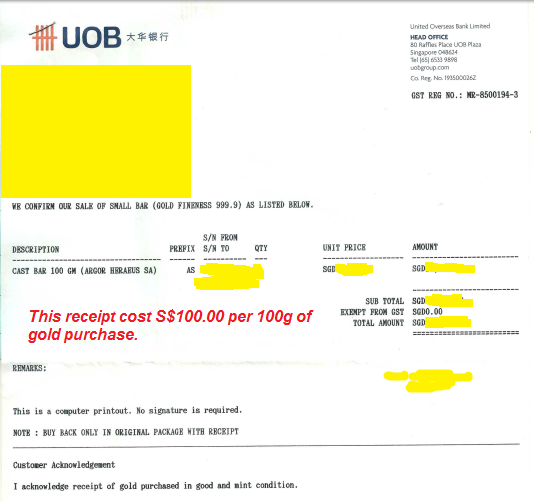 This means that if we bought 200gm of gold from UOB, lost the invoice and if we are selling it back to UOB later, they will deduct S$200 from our sell price. Again, it is more or less idiot proof when you are at the Main UOB Branch. Just tell them that you need to open a Silver account and the staff will guide you through. 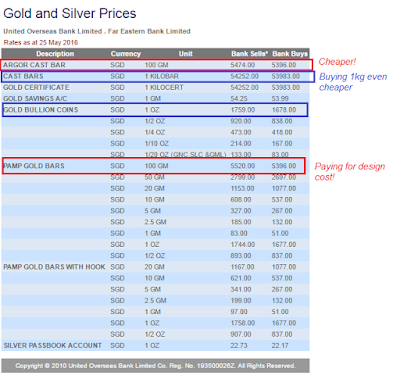 One thing to note is the charges of gold or silver account per annum! It is slightly more difficult to comprehend. 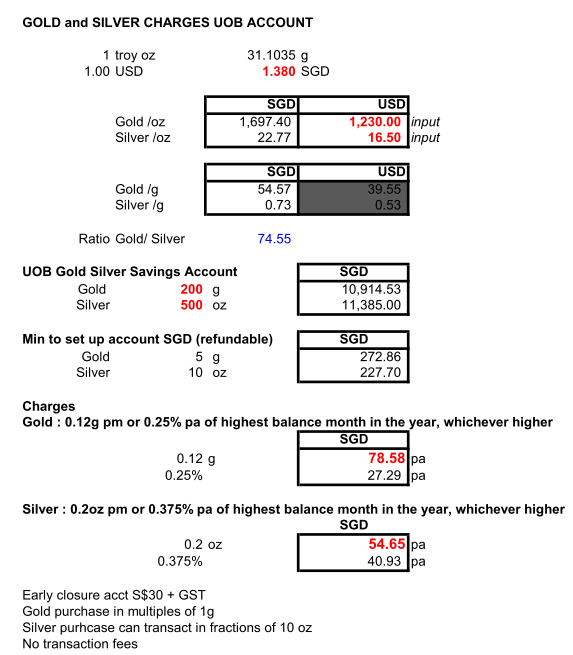 Imagine that you are owning 200g of Gold and 500 oz of Silver in UOB account, then the charges per annum will be ~S$76 and S$55 respectively. Also note that there is a minimum amount or deposits to set up the accounts but it is refundable in cash once you close the account. The deposits cannot be used for trading, and to ensure the account is active, the minimum deposit amount must be there. For more info on rates, refer UOB website here. Two other ways to own the precious metals in a more direct manner is to buy Gold ETF on SGX and Ishares Silver Trust on NYSE i.e. GLD US$ (O87: SGX) and ISH Silver (SLV.P : NYS)! Both is traded in US$! Alternatively in Singapore, you can also buy and store physical gold or open account with BullionStar. 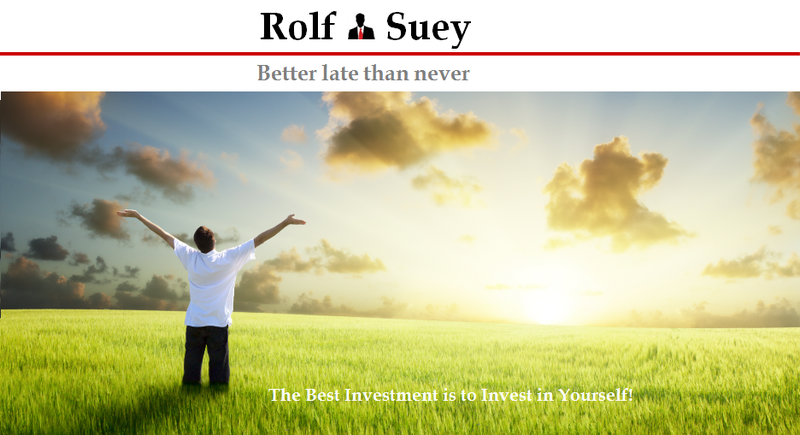 Refer webpage here. Of course you can visit gold jewellery shop as well. Read : When is it a Good Time to Buy Gold? There are other precious metals ETF or related stocks that you can buy too. I will not elaborate it here though. Disclaimer: I own physical gold, UOB silver account and Gold trust. In the Singapore finance blogosphere, there are so many analysis on stocks, but not many on gold and silver. Even if there is, there is little explanation on the fundamentals of the precious metals and the role it plays in the history of mankind. 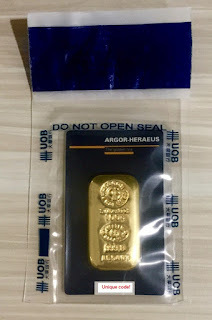 Instead, there are more articles related to instructions how and where we can buy precious metals in Singapore OR using gold as an hedge against inflation or as insurance OR basically showing the charts of pricings/returns over the year! Understand the history of gold will give you a better perception of the future impact it is likely to have in the world monetary system. These are paper silver and not backed by actual physical silver in the vault. Gold or silver, paper or silver? may I ask? I assume u only care abt $ n cents! Just look at the spread between Uob and Bullion. I normally love to share, but errrr to Anoymous readers, I tend to share lesser during Q&A. Because I believe being honest and smartlytransparent is one important factor to be successful or even rich and sustainable for a long time! Hope u understand. U can always drop me an email. Have a nice Sunday!